Nexteer Automotive, a motion control company located in Auburn Hills, has appointed Michael Richardson as its new president and Tao Liu as global COO. Richardson, of the Great Lakes Bay Region, a 42-year company veteran, will become president of the company while also retaining his previous title of executive board director. 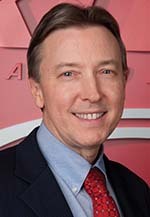 He will continue to advance the product agenda set by Nexteer’s Board of Directors. Richardson was previously responsible for temporary president actions and the daily operations of the company. He began his automotive career with GM in 1974 as a co-operative student at the former Saginaw steering gear division. Richardson graduated with a bachelor’s degree in mechanical engineering from Kettering University in 1979 and a master’s degree in business administration in 1990. Liu,(right),former vice president and COO,of Shanghai, is now responsible for the daily operations and strategies of the company. Liu was previously responsible for the Asia Pacific division through a period of expansive growth, delivering high-levels of regional responsibility. Liu joined the company in 2006 as the China operations manager of Delphi Steering. He graduated with a bachelor’s degree in industrial automation from Tsinghua University in China in 1987 and a master’s degree in business administration from Perdue University in the United States in 2001.